Exceptional Raking Performance: Up to eleven tangential tine arms and four double tines per arm provide high tine frequency to ensure clean raking performance in all types and volumes of crops. Easy Set for Transport: The Kubota RA1035 width can be reduced to 5'9" for transport and storage by placing the tine arms on the carrier frame. 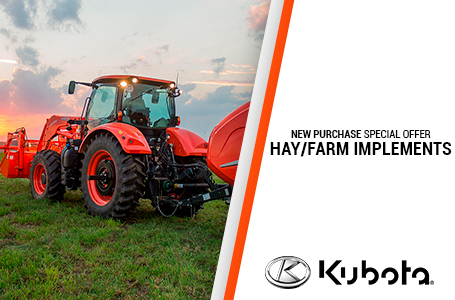 The Kubota RA1042T can be easily converted to 6'7" for transport and entering into smaller fields or narrow gates. Curved Tine Arms: All Kubota FarmLine rakes feature cranked tine arms for handling high volume crops, giving cleaner raking performance and optimized swath formation. This design ensures that the row of tines on each tine bar has a more effective approach angle to the oncoming crop and also gives a cleaner lift out of the tine from the formed swath. Outstanding Durability: The Kubota rakes are equipped for maximum raking performance. The FarmLine rakes all feature 9mm wire diameter tines for outstanding durability. Ideal for Low Horsepower Tractors: The Kubota RA1035 and RA1042T single rotary rakes are designed for low power requirements, while still delivering considerable working width of 9'2" & 11'6" with swath and 10'2" on the RA1042T & 13'9" including swath, respectively. With a pivoting three point linkage machine (RA1035) as well as a trailed version (RA1042T), there is a model to meet any field or crop needs. 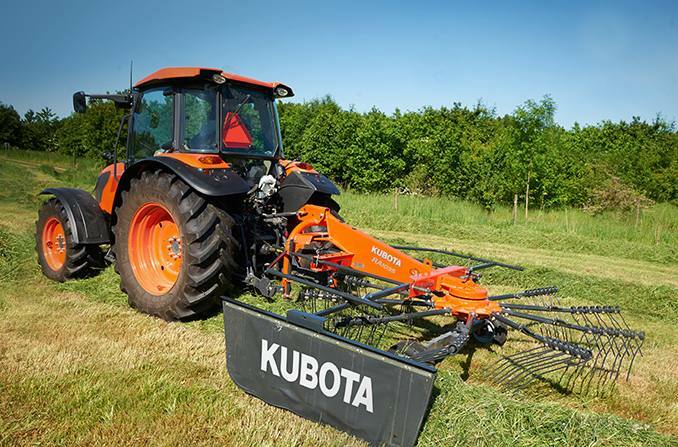 Kubota Compact Rotor: The rotor is grease lubricated within a fully enclosed housing. The maintenance-free cam track, cam followers, as well as the bearings of the rotor star axles, are permanently running in an oil bath. Both the rotor and pinion shaft are mounted on two bearings for maximum strength and long service life. Farmline Rakes: Kubota's FarmLine rakes feature oil-immersed cam discs, guide rollers and tine bearings, making them low maintenance. All rakes are fitted with curved tine arms, to ensure a regular and even swath formation in all crop conditions. Additionally, the curved shape increases the tine working area as the rake is moving and allows a higher lift out of the swath, which is critical in high volume crops, ensuring a very uniform swath. Our expert knowledge in producing the right swath not only optimizes the capacity of the baler, but also increases the quality of the forage. Working width (ft): 11 ft. 6 in. Transport width (ft): 5 ft. 9 in. Transport length (ft): 11 ft. Parking height (ft): 5 ft. 7 in. Rotor diameter (ft): 9 ft.2 in. Tine diameter (in): 0.35 in.